The Multihandicapped Unit was established in 1997 to caters to the needs of the visually impaired children with additional disabilities. 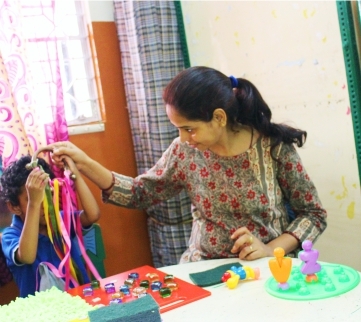 The children are being provided intervention services through a team of trained and dedicated educators as well as other professionals such as Speech therapist, mobility Instructor, Physiotherapist and 2 custodial workers. Individualised Educational Plan is prepared for each child after detailed assessment. Goals selected cover different areas and are commensurate with the child’s level. The children are taught various concepts as far as possible through real life experiences. Apart from the regular implementation of the individualised educational plan the children of the unit are involved in various extra curricular activities. The unit was set up with the support of Sense International India in the year 2001. The unit caters to children with varying degree of dual sensory loss of vision and hearing. The combined effect of this has the greatest impact on child’s communication, mobility and performance of day-to-day tasks. To provide good intervention services to children with deafblindness skilled staff trained in deafblindness are required. Both the units work together to provide services to about 89 children. Services are being provided at NAB as well as through community based rehabilitation programme in different parts of Delhi. With the support of Sense International India RLC (North) was set up in 2007. The aim of establishing the centre was to identify new organisations willing to work with children with deafblindness. Building awareness through sensitisation events as well as conducting detailed workshop on deafblindness has been the thrust of the RLC. It also provide technical support in northern region. The RLC is responsible for developing need based literature on deafblindness. For all enquiries please write to us using contact us form.